Reliably determine the atmospheric pressure using the built-in sensor of your iPhone (for which reason this app does not work with phones older than iPhone 6). The app does not query a website or an online service but actually uses your phone to determine the barometric pressure in kPa and in mm Hg – This makes it very accurate and on the spot, as opposed to estimations for ample areas. Is there high atmospheric pressure, it is likely that it will act as a barrier to approaching weather systems, diverting them. A lift, especially combined with wind, could bring in clouds and rain. Rises the pressure rapidly, the skies will probably clear and conditions will improve. The larger the change in pressure, the larger the likely weather change. How can I know of subtle pressure changes caused by weather? Is it likely I’ll need an umbrella today? Maybe the sun will come out shortly? Don’t just speculate, get a scientifically founded answer to all these questions. 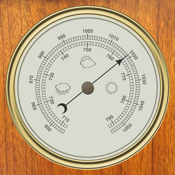 Please note: the Barometer only works with iPhone 6 and 6 Plus!